What else is there in Europe? All joking aside, we awoke a bit after 8 to have breakfast with our host and the other american guest he had. Thomas went all out and made us a feast of bread, jams, cheese, more of the great salami, and juice. We chatted over breakfast some, and then set out for the day a bit before ten when he headed off to work. It was a light drizzle as we set out with no particular place to go other than to explore Sazburg. Thomas used to be a tour guide in the castle, and gave us some ideas of places to go. We wandered our way towards the river and crossed it, finding that much of the festival had been taken down, with only a few craft stands still up. 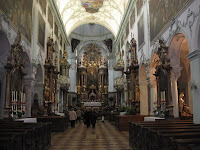 Our first stop was the Franciscan church. Thomas had said this church was quite dark inside, and he was right. We wondered how many candles they had to light before electricity to be able to see in here. 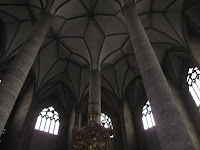 The only windows were towards the front of the church, way up high, so the back half was like being in the dark. One thing we noticed is the giant columns in the middle were made of concrete instead of marble like so many others we'd seen. There was also someone playing the giant organ the whole time we were in there, which was fun to hear. One random fact about this church was that its basically next door to the Salzburg Cathedral, but while that was destroyed in WW2, this one didn't receive any damage. Next we walked along the cliff side as Thomas had said there were caves the church used to use to hide people or things. All we could find was a place that used caves as sort of a conference or party room area, so we were a bit bummed out as cave exploring would have been fun on this rainy day. We then wandered up and down a street closed off to cars that has many high-end shops. It was fun to window shop even if we couldn't afford any of it. 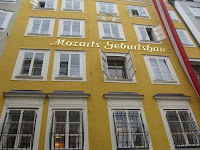 Also on this street is the birthplace of Mozart. We poked our noses in the main entrance, saw a large crowd, and noticed it cost more than the Louvre to tour, so we passed, not before snapping a few pics of the outside though. Being it was about noon, we made our way to the republic cafe where we ate yesterday. 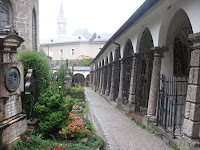 We thought we would spend a few hours there having lunch and using the only internet we could find in Salzburg. We found a table near the window and each ordered a beer. For lunch Charlie got a panini style pork sandwich with cheese, tomato, and a chili cocktail sauce, served with a side salad. 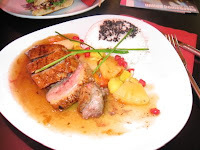 Heather ordered a delicious smoked duck breast with white rice with black sesame seeds. It was served with tropical fruit like pineapple, mango, pomegranate seeds with a yummy honey glaze sauce over it. The duck tasted more like a steak than chicken, and wasn't greasy or gamey in the least. We sat and enjoyed our food and messed around on the internet while it poured like crazy outside. When we saw a break in the rain we headed out again towards St. Peters Abbey. We made a quick pass through the church and headed outside to the cemetery, whos likeness was used as a set in The Sound of Music. We were kind of surprised how new some of the gravestones were as this church was quite old. 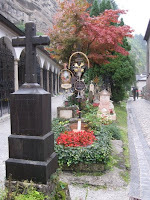 We imagine the oldest ones were in the catacombs in the mountainside we didn't tour. 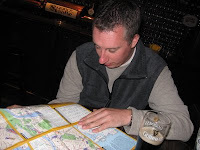 We started walking towards the main area of the city again, and stopped off at an Irish pub for a bit while we waited some rain out. About 4:30 pm we thought we'd head back towards Mirabell garden as Heather saw a scarf there she wanted to buy, and then head back to Thomas's apartment. Much to her disappointment, they had sold the blue one she wanted, so we kept walking. We walked back towards Thomas', and looked for a supermarket near his place, as we had said we'd cook him and his other guest dinner tonight. We weren't too impressed with the Lidl store, so we went to the market up the road about a block. One thing we should add is we haven't quite figured out how to get a shopping cart yet here, as it involves paying 1 euro as sort of a deposit on the cart, and unlocking it from all the others, so we went without one. The other American girl staying there is a vegetarian so we came up with making a vegetable risotto with grilled cheese, tomato, and pepper sandwiches. We bought all our ingredients and headed back to our hosts apartment a few blocks away. Back at the apartment, Charlie got to cooking the risotto, which really is a labor of love as it involves standing at the stove in front of it for a good 25 minutes, as Heather got everything for the sandwiches ready to toast. The food turned out to be a wonderful hit, and we enjoyed it and good conversation over our meal. After dinner we each took a much needed hot shower after being out in the rain all day, then settled in the living room with Thomas and Jeanie from Baltimore to relax. We were excited to see there was an American baseball game on tv, the Tigers and Devil Rays were playing. It was fun talking to Thomas about baseball and college football, as he's a big fan of both. We'd both noticed this was the first time in over 3 weeks we'd actually been sitting down relaxing in front of a tv. We took turns working on the blog and when the game was over we decided it was bedtime, as we were both quite tired. Your blog makes me hungry. Please send me good food. 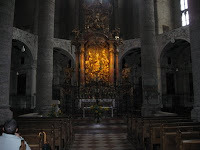 God must have blessed and saved the Franciscan church for you to view - even in it's darkness I am sure you found some ray of light. Mozart - what history that is!! So, the St. Peter's Abby from the Sound of Music - you did not happen to find any spark plug wires pulled from a distributor lying on the grounds, did you?? I feel I spent so very much time on your blog because I feel that I am traveling with you on your journey - maybe a journey in time, maybe a journey in faith and definitely a journey in life. Munich, Germany - All Aboard!